A couple years ago, I played around with HDR a lot, but for some reason, HDR lost its charm with me. Lately, I have been looking at various photographers’ (including Barry Armer’s) HDR work. As a result, I got the bug to give HDR another try. 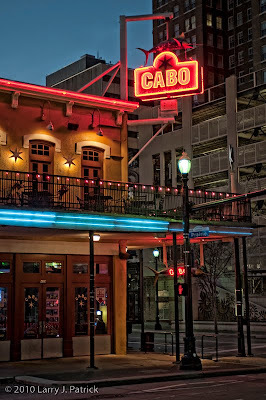 I was downtown Houston trying to find a site for an upcoming shoot when I saw this early morning scene of Cabo. I used HDR to capture the full range of the scene. I shot five frames in the aperture priority mode at -2, -1, 0, +1 and +2 EVs. I used Photomatix to merge the five frames and tone map the final image. I wanted the final image to show all the details that my eyes were seeing. Camera settings: Nikon D3, Nikon 28-70mm f/2.8 at 62mm shot at ISO 200, f/4 and 1/15th of a second and on a tripod for the 0 EV exposure. Photoshop—used Noise Ninja to reduce noise in the photograph. Nice shot. It has good detail and even exposure thoughout the photo. Looks like a good location for a shoot too. Well done HDR. Not the typical HDR. This one brings out all the details but does it in a subtle way. Like the scene and the colors. I like all the details within the photo and the fact that the lights do not seem to be blownout. The contrast between the warm lights and the cool night sky is nice. I like the colors and the details however, the subject is not that interesting to me. I wished there was a person or something else under the overhang of the building to draw your attention. Nice execution of an HDR Larry. The result is a pleasing downtown city vignette with lots of detail and pleaseing colors. I like that the lamp post light is not blown out. Tricky at best. Wonderful colors. The subtle colors and details make this a photo that I would look at and then study. I would probably never hang something like this in my house however I would go back and look at it in museum. Good work. I like the colors however I find the subject to be boring. It does not hold my attention. You worked well with what you had. It is good that the image is not at an extreme of saturation.